As anyone who has struggled with dodging and burning in the darkroom will tell you, print-making is a little bit of chemistry and a whole lot of art. With the coming of the digital age, almost anyone can capture an image and print it. But most of those prints don't meet the standards of fine-art prints. They may be lacking in numerous ways: sharpness, clean and true color, good contrast, proper blacks and whites, or a good marriage between paper type and ink used. I know all this because print-making is the number-one issue that I have grappled with as a photographer. While my on-screen images began to improve greatly, printing was another story. I just couldn't get them to look as good as they looked backlit on my screen. I decided to upgrade my technology to see if it would help. I bought a Canon i9900, which had 8 inks. Right away it really improved my work. But I still was dissatisfied, often printing a dozen variations of a single image trying to get it right. In particular, color images were problematic. I read books on color theory and management and bought a ColorMunki. Each step I took got me incrementally closer to quality prints. Before long, I wanted to make larger prints, so I went to a PixmaPro 9000 Mark II, which had 8 dye inks. It took me awhile to grow into this printer. It was extremely good, especially with black & white images. But I wanted my color works to be as good as my B & W were, so after a few years, I began to dream of a large-format inkjet printer—the Canon iPF6450. 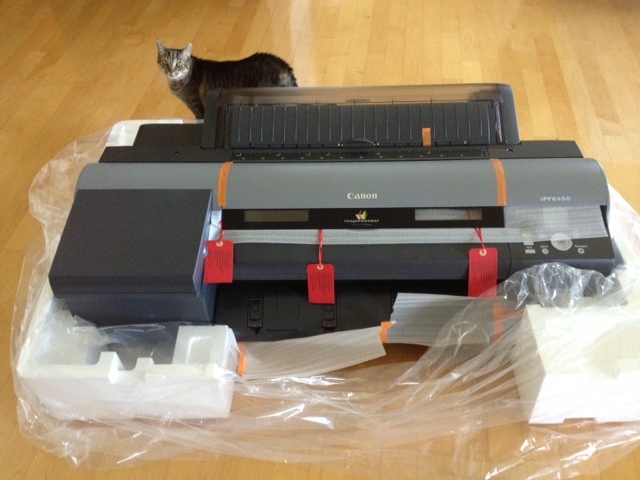 It has 12 pigment inks and will accept 24-inch roll paper as well as single-sheet paper. I got this printer in early 2013 and my print-making stepped up to a new level. So, in summary, what I have learned is that making superb fine-art prints requires getting it all correctly in Photoshop as well as understanding icc profiles, using the right paper, and having a great printer. I am well on my way! The final note on print-making is something I learned from Ben Long in one of his on-line photography workshops: print it and live with it awhile to see if keeps pleasing you. So now I put a print up on my wall and look at it every day for at least a week. If I see something I want to change, I add a note in the margin. Then, when I finally see nothing new and am ready to go to the next step, I make my changes and print it again.